Student diplomacy prevailed where two democratically elected state governments failed miserably. The North East Students’ Organisation (NESO) on Tuesday persuaded the All-Assam Students Union (AASU) to temporarily withdraw the indefinite economic blockade against Nagaland on humanitarian ground. The UP Vidhan Sabha secretariat yesterday sent a certified copy of the declaration of assets made by former chief minister Mulayam Singh Yadav in 1977 to the CBI which is investigating the disproportionate assets case against the Samajwadi Party national president. Even as the government tabled the Uttarakhand Police Bill, 2007, before the state Assembly today, state cadre IPS officers expressed strong reservations against it on the issues of accountability and functional autonomy of the police force. The neglected Indian National Army (INA) Memorial within the Red Fort complex had a surprise visitor today. Prime Minister Manmohan Singh visited the memorial and expressed concern about its poor upkeep. Even as the police is trying to find links between the UK terror plot and the 7/11 Mumbai train blasts, it has come to light that alleged Glasgow attacker Kafeel Ahmed had tried his best to safeguard the hard disc of his computer before leaving for the UK on May 5. Investigations into the Bangalore connection of the UK terror plot have revealed that suspected Glasgow attacker Kafeel Ahmed was working as a design engineer for a leading outsourcing company servicing Boeing and Airbus besides other big names in the aviation and defence industry. Indian oil major Oil & Natural Gas Corporation Ltd (ONGC) has set a target to touch the 3 million metric tons (MMT) mark in crude oil production from its oilfields in Assam within two years given that it has managed to check the downward trend in crude output in the year 2006-07. Incessant rain crippled normal life in Vadodara city today as six of the 12 talukas in the eastern part of the district continued to reel under the threat of flash floods because of the rising Mahi and the Narmada rivers. The Supreme Court has taken a serious view of most of the states not making operational all the ‘Anganwadi’ centres sanctioned and funded by the Union Government for children below six years in rural areas, which functioned as pre-primary schools with the mid-day meal facility. Anganwadi workers and helpers observed a one-day all India strike today, demanding conversion of integrated child development scheme (ICDS) into a permanent service and their recognition as employees. The Lucknow Bench of the Allahabad High Court today maintained status quo ante in the demolition of the multi-million-rupee Dr Bhimrao Ambedkar State Sports Complex at Gomti Nagar in the state capital. The case would now be taken up for hearing on July 19. As thousands of illegal Indian immigrants, a majority of them from Andhra Pradesh, face an uncertain future in the United Arab Emirates, chief minister Y. S. Rajasekhar Reddy has sought the central government’s intervention to see that the gulf country grants them resident status. The Supreme Court today did not find any substance in the allegations of receiving funds from foreign sources by Narmada Bachao Andolan (NBA) leader Medha Patkar and her associates to carry out the agitation against the Sardar Sarovar project and rejected a PIL for CBI probe. Death of 17-year-old Samina Khatun in a city hospital at Entally near Sealdah today caused uproar, leading to mass demonstration and road blockade during office hours, which disrupted traffic movement in the city. The country is officially mourning the death of former Prime Minister Chandra Shekhar but this has not stopped the BJP and the Congress from resuming their slugfest over the upcoming Presidential election. Jammu and National Panthers Party president Bhim Singh has written an open letter to all members of electoral college for Presidential poll seeking support for Vice-President Bhairon Singh Shekhawat, who is contesting as an independent candidate backed by the NDA. Defence minister A.K Antony today said the 155-mm artillery guns fielded by Bofors and the Israel’s Soltam had not met Army’s parameters during field trials and that the government would be floating a fresh global tender for the same. Bollywood starlet Monica Bedi, imprisoned in connection with two passport forgery cases in connivance with underworld don Abu Salem, today moved the Supreme Court for transfer of one of the cases from Madhya Pradesh to either Delhi or Mumbai. ‘Green’ hurdles in the way of the 2010 Commonwealth Games village are increasing and environmentalists have now approached UPA chairperson Sonia Gandhi, urging her to save the Yamuna and shift the proposed infrastructure on the riverbed to a “safe site”. HC halts Mayawati’s demolition plan. Met department predicts more rain. Miracle water that cures animal bites. The Sivasagar district units of the AASU had launched an indefinite economic blockade against Nagaland choking supply lines to the neighbouring state via Sivasagar and Jorhat districts in Assam in protest against Thursday’s killings of three Assam villagers by Naga raiders in three bordering villages in the Gekeky area of Assam. The blockade created shortage of essential commodities and fuels in at least two districts - Mon and Mokokchung-in Nagaland making the common Naga people bear the brunt of a crime committed by a group of armed Naga raiders. The AASU adviser, Dr Samujjal Kumar Bhattacharyya, said the blockade had been temporarily withdrawn with effect from Tuesday at the request of the NESO and Naga Students Federation (NSF). The AASU and the NSF will meet to discuss the issue here on July 14 at the initiative of the NESO. “We have lifted the boycott temporarily on humanitarian ground to ameliorate sufferings of common Naga people across the inter-state boundary. But our demand for bringing the culprit of July 5 attack on three villages at Geleky by Naga raiders stands,” he said. The AASU demands safety and security of people living on the Assam side of the inter-state boundary with Nagaland, setting up of a border outpost in the Geleky area in Sivasagar district, permanent solution to the border disputes between Assam and Nagaland, punishment to Naga raiders of July 5 attacks on three border villages and rehabilitation of affected villagers in the same place. Meanwhile, the Assam police asked its counterpart in Nagaland to hand over the culprits involved in last Thursday’s raid on three Assam villages. However, the Nagaland police is yet to respond to it even as political leadership of both the states maintained a stoic silence over the issue. The AASU leaders today lambasted Assam chief minister Tarun Gogoi for remaining a mute spectator to the situation where lives and property of border villagers were in danger. “We are surprised at the silence of chief minister Gogoi. It is tantamount to ignoring a burning issue affecting people of the state and smacks of arrogance on part of the chief minister who is serving his second consecutive term,” the AASU adviser said, warning of an intensive statewide agitation to make government take steps vis-a-vis border disputes with Nagaland. A letter from the central investigating agency seeking 30-year-old information regarding the status of assets of Yadav who was then cooperative minister in the Janata Party government was received by the office of the principal secretary (Vidhan Sabha) R.S. Pandey on Saturday. According to the 1977 declaration, 1977 Yadav owned 2.53 acres of land and a house in his village of Saifai in Etawah. He also had Rs 9355.20 in cash in the Karhal branch of Bank of India and Rs 3100 in an account in Lucknow. Thirty years ago the Samajwadi party leader also owned a Willy Jeep and a Bajaj scooter together worth Rs 10,000. He also held three Life Insurance policies - two worth Rs 3000 and one of Rs 10,000 for which he paid an annual premium of Rs 210, Rs 105 and Rs 710 respectively. Earlier this year, while filing his nomination papers from the Bharthana constituency in Etawah for the Vidhan Sabha poll, he, in an affidavit, had declared cash and properties worth over Rs 2.25 crore. In the same village of Saifai his agricultural land increased to 14.63 acres and cash over Rs 35 lakh in eight bank accounts. The CBI is probing the disproportionate assets case against Yadav and his family members on the direction of the Supreme Court. On March 1 the apex court had asked the CBI to conduct a preliminary inquiry into the disproportionate assets charges against the then chief minister. The decision had come in response to a writ petition filed by Vishwanath Chaturvedi alleging that Mulayam Singh Yadav and his family members had amassed properties worth more than Rs 10 crore by irregular means far beyond their known sources of income. Though the Bill aims at providing a new police law, regulations and management of the police, redefine its role, duties and responsibilities and to enable it in a professional, accountable, people friendly and responsive manner, the IPS Officers’ Association, at a meeting held here today, objected to certain provisions of the Bill. The association plans to give a representation to the select committee of the House to look into merits and demerits of the Bill. The association observed that the Bill did not offer much change from the existing Police Act of 1861. “Though the new police Act was meant to give a modern, professional and autonomous approach to the force, certain provisions of the Act were retrogressive,” said president of the association Alok Bihari Lal. As the Bill proposes to put the district police chief under the command of district magistrate, Alok expressed apprehension that the parallel line of command proposed in the bill was a contradiction and would harm the independent and professional functioning of the police force. The Bill has been prepared in compliance with the directions of the Supreme Court, which asked the state government to introduce police reforms in their respective states by March 31, 2007. The BJP-led Uttarakhand government had submitted an affidavit in the court to frame a new police Act. As part of the proposed reforms, the government has already constituted a state security commission, police complaints authority and the police establishment board with larger aim to discourage political interference in the police functioning. The neglected Indian National Army (INA) Memorial within the Red Fort complex had a surprise visitor today. 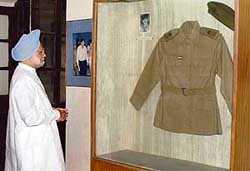 Prime Minister Manmohan Singh visited the memorial and expr essed concern about its poor upkeep. Expressing concern at the poor upkeep of the museum and premises, Manmohan Singh hoped that such places of historical importance were brought alive with a mix of display of historical material and other lively activity of interest to the general public. Police sources said here today that they were investigating links between the Ahmed brothers and the accused in the 7/11 Mumbai blasts. One of the accused in the Mumbai blasts, Muzzamil, alias Abu Shaheed, was earlier working as a software engineer in Bangalore and had been arrested from the city after the blasts. The police wants to find out whether Muzzamil and Kafeel were known to each other and whether they were members of an educated sleeper cell of extremists living in Bangalore. Kafeel had also visited Pakistan prior to the failed UK bombings. The police has found that Muzzamil had visited Pakistan for “training” prior to the Mumbai blasts. Muzzamil’s brother Faisal Sheikh was also involved in the 7/11 conspiracy. An Australian investigator is said to have reached Bangalore to collect background information on Dr Mohammed Haneef, who is being questioned about his role in the UK terror plot in Australia. The Bangalore police has said it would assist the investigator in every manner. Meanwhile a high-level meeting, scheduled to be held today to review the entire case could not be held due to preoccupation of Chief Minister H. D. Kumara-swamy. Kafeel, who has been admitted to a Glasgow hospital with 90 per cent burns, worked with Infotech Enterprises in Bangalore from December, 2005, to August, 2006. Bangalore police sources said they were investigating whether Kafeel had access to sensitive information about Boeing and Airbus during his stint with Infotech, a company which has been rated as a “Global Outsourcing Rising Star” by an international agency recently. Kafeel quit the company abruptly. Infotech Enterprises is a $ 120-million outsourcing company, headquartered in Hyderabad and has offices around the world, including the UK and the US. Company assistant general manager, corporate communications, K. S. Susindar confirmed Kafeel had worked for nine months in the company. “Kafeel was very sincere at work, a very polite person and usually kept very much to himself”. However, Susindar refused to disclose the nature of projects undertaken by him. He, however, confirmed they were in the aeronautics field. The company claims it is very difficult to for its personnel to get sensitive information about their clients. All designers work at the micro level and cannot access information outside their brief, the company said. It said it could not tell as to what references Kafeel had given while applying for the job. The ONGC’s Assam asset executive director J G Chaturvedi said the company had hired services of several globally reputed expert groups to help improve output from the oilfields in Assam. He exuded confidence to achieve an annual crude oil output of about 3 million metric tons by the end of 2008-2009. In the current financial year, ONGC has fixed a target of producing 1.51 MMT of crude oil. “It is a fact that the production of crude oil in the Assam oilfields had started declining since 1991 after we hit an all-time high of 3.15 million metric tons that year,” the senior ONGC official said. The decline in output, 1.16 MMT in 2005-2006, was sharp by any standard and that rang the alarm bell for the oil giant. Ageing of the oilfields as well as the various production facilities in Assam were attributed as key reasons that triggered the sharp decline in crude oil production. The ONGC official said delay in modernisation and revamping of the existing installations could be another reason for it. With heavy rain lashing Vadodara since this morning, most parts of the city, including the posh Alkapuri, J P Road, Manjalpur, Subhanpura and Ajwa Road, reported severe water-logging. Residents of around a dozen housing societies, located in low-lying areas in and around the city, bore the brunt of the rain fury. According to official sources, the situation in six eastern talukas of the district, Savli, Vadodara rural, Padra, Dabhoi, Sinor and Karjan, which were put on high alert following the overflow in the Narmada Dam and release of 300,000 cusecs of water from the Kadana dam into the Mahi river, has shown little improvement. Yesterday, the authorities had evacuated over 1,500 people from these flood-prone areas to safer places. Ahmedabad:The People’s Committee on Gujarat Floods-2006, a fact finding committee set up by two non-governmental organisations, has concluded that last year’s floods in the state were a man-made disaster. “Those centres which have been sanctioned up to January 2007 shall be made functional by September 30. It is made clear that if there is any non-observance of the time period fixed, it would be seriously viewed,” a Bench of Justices Arijit Pasayat and S. H. Kapadia said. The states were directed to file affidavits on compliance of the order. The deadline for filing the affidavits has been fixed as July 20, August 10 and October 10, according to the hearing date given to a group of states. The court said out of 10.53 lakh sanctioned Anganwadis, 2.72 lakh are yet to be opened and major defaulters include West Bengal (37,088), Uttar Pradesh (33,987), Jharkhand (32,097), Bihar (22,761), Madhya Pradesh (19,432), Assam (11,635), Manipur (7,639), Punjab (5,439) and Haryana (1,225). The court said the backlog had to be cleared immediately to ensure that the funds granted by the Centre for the purpose were properly utilised. It was a matter of concern that even the sanctioned centres have not been made operational despite repeated directions, the court said, reminding the states that the importance of the Anganwadis with respect to small children in rural areas of the country had been highlighted by it in several orders issued since 2001. The order was issued by the court on a pending writ petition by People’s Union for Civil Liberties (PUCL), seeking a direction to the Centre and the states to make all the sanctioned Anganwadis operational. Though the total number of Anganwadis sanctioned up to January is 10.53 lakh, the PUCL had sought to open all 14 lakh centres as targeted by December 2008. According to the earlier order of December 2006, the apex court had directed the Centre and the states to give special preference to identifying Scheduled Castes and Scheduled Tribes hamlets or habitations for setting up the Anganwadis on a priority basis. It was also directed that the upper population limit for one Anganwadi centre should not be increased from the existing 1,000. A minimum population for opening the centre is fixed at 300. “The rural communities and slum dwellers should be entitled to an Anganwadi on demand, which shall be fulfilled within three months” the court in its Decemebr 2006 order had said. It had clarified that for opening an Anganwadi on demand, the strength of 40 children should be treated as sufficient. The decision virtually blocked Mayawati government’s attempt of overnight pulling down the stadium to reportedly make way for a memorial for her mentor, late Kanshi Ram. The stadium is adjacent to her dream project- Ambedkar Udyan. Caught off-guard by strong protests of the sports community and prompt response of the high court, the state government decided to hide behind the excuse of a reported “threat perception” for hurriedly vacating the complex. It was late on Monday night that half-a-dozen odd-families of sport coaches and student inmates of the stadium complex were suddenly asked to move out. Huge bulldozers and heavy police presence left nothing to imagination. The hassled residents had been given no advance notice. Sportspersons, sports directorate officials and their families had to pack their bags in a hurry and leave the complex in the dead of night. Poignant scenes were witnessed as stunned families started packing their bags while the labourers were seen speedily moving out expensive sports equipment in the most causal manner in cycle rickshaws. No sports directorate official was present as disbelieving local residents, passersby and media persons looked on at the manner in which the cricket hostel and dwellings of coaches were being hastily vacated. SSP Lucknow B.P. Jogdand, who was present at the site, refused to comment. At around midnight, some representatives of the families approached Justice Pradeep Kant, who called brother judge D.P. Singh, and admitted the petition, following which the court stayed the demolition at around 1.15 a.m. The court also allowed the families to return to their premises, said Prashant Chander, counsel for the petitioners. According to Chander, later in the day, the same bench heard the state government officials who maintained that the complex was not to be demolished and was merely being vacated due to a “threat perception”. Substantiating their claim, the state government officials presented to the court, an intelligence department report, dated June 8 - the letter that speaks of some sort of security threat to Ambedkar Memorial, informed Chander. However, the court asked the officials why the state government decided to act on the letter a month later. The court also asked the SSP Lucknow if he was aware of any such threat. The SSP denied knowledge of such a threat, underlined Chander. The court has now given the state government four days to file a counter affidavit and three days for filing a rejoinder. The UAE has set September 30 as the deadline for deportation of all illegal immigrants. About 60 per cent of illegal Indian immigrants are from Andhra, mostly constituting the semi-skilled workforce. In a letter to external affairs minister Pranab Mukherjee, the chief minister wanted that their case be viewed from a humanitarian angle as many of the immigrants are from socially and economically deprived sections of society. “I appreciate the legality of this matter and the compulsions behind the government of UAE’s decision to expel these immigrants. However, there is a human angle to the problem. At least, the deadline for exiting the country should be extended by an year,” Reddy said. The chief minister brought to the notice of the Centre that a majority of the immigrants were exploited by unscrupulous agents in India and UAE and had invested their meagre savings and earnings in the hope to make a better living for themselves and for their families back home. Under these circumstances, if they were to be repatriated immediately, many of them would be subjected to severe economic hardship and trauma, he contended. Reddy also promised the union minister that the state government would take all necessary steps to ensure that people going to UAE and other countries in future did not fall prey to such unscrupulous employment agents. “Extending the deadline will help the immigrants in at least planning carefully for their return and this will minimise the economic hardship to their families,” said the state minority welfare minister Mohammed Ali Shabbir who is also in charge of the affairs of non-resident Indians from Andhra. A Bench of Justices C.K Thakker and Altamas Kabir said the allegations relating to receiving of funds from foreign sources levelled in a public interest litigation (PIL) filed by a private organisation were “vague” and in absence of any substantive material did not make a prima facie case for the CBI inquiry. The National Council for Civil Liberties (NCCL), in its PIL moved in 2006 had claimed that NBA was receiving regular funds from abroad and the same were being used to sustain a campaign against the Sardar Sarovar project by it. Not finding any substance in the NCCL’s petition, the apex court imposed a litigation cost of Rs 5,000 on it. Patkar’s counsel had vehemently denied the charges and contended that the PIL was aimed at defaming her and the NBA, which was raising the issue of rehabilitation of people displaced due to the execution of the project. The NBA had also launched a campaign against the big dams in the country. While the NCCL, in its petition filed by its president V.K Saxena, had sought to invoke the provisions of Foreign Contribution Regulation Act (FCRA) against Patkar and her organisation, the Centre had told the court that on examination of the books of accounts of NBA nothing illegal was found by it. But the BJP-ruled MP and Gujarat had supported the PIL. The MP govt counsel had stated that a probe by its agencies had found dollars deposited in the account of one of Patkar’s associates and at least details about $ 40,000 were found in his computer. Samina, a first-year student at Victoria College, was brought to National Medical College and Hospital last night with acute pain in the abdomen. She was immediately admitted to the hospital and later, at midnight, she was taken to the operation theatre. In the morning, when her relatives and friend came to visit her, they saw her naked body lying on the floor near the operation theatre with signs of sexual assault. Two junior doctors, who attended to her, were also found missing. Suspecting foul play, relatives and friends of the victim soon gathered at the hospital premises and demanded explanation from the hospital authorities for Samina’s death. They suspected that the doctors on duty had raped her and then took her to the operation theatre, where she died. They demanded a proper inquiry into Samiana’s death and arrest of the two junior doctors who were absconding. The wave of agitation soon spread and a large number of people gathered near the hospital. However, in the evening, the situation was brought under control. In fact, the war of words between the two sides escalated further today as several Congress MPs, led by the former Manipur Chief Minister Rishang Keishing, lambasted Lok Sabha opposition leader L.K. Advani for seeking a conscience vote for the NDA-backed Presidential candidate. In a hard-hitting letter to Advani, Keishing and five other Congress MPs, described his appeal as a “damaging admission of abject defeat” and accused him for contempt of democratic processes by calling for a “conscience vote” against the UPA nominee on baseless charges. Others who have expressed similar views include Rashid Avi, Jaiprakash Aggarwal, Karmendu Bhattacharjee, Jai Prakash and Karan Singh Yadav. The rejoinder to Advani’s appeal comes on a day when the BJP upped the ante with the launch of a website and the release of a booklet, detailing various charges of alleged financial irregularities against the UPA Presidential nominee Pratibha Patil. Keishing said the “unprincipled mud-slinging” being resorted to by Advani is entirely in keeping with the tradition of the RSS but told Advani that his party’s “devious and mischievous methods” will be rejected “overwhelmingly” by the electoral college. Although it has been slow to counter the BJP’s relentless campaign, the Congress is now making amends for the lost time. Initially coy about making any personal allegations against the NDA-backed candidate Bhairon Singh Shekhawat, the party has decided to hit back. After unearthing old cases of alleged irregularities against the Vice-President, parliamentary affairs minister and Patil’s official representative Priyaranjan Dasmunsi charged that Shekhawat is misusing his office in his campaign. Dasmusni said Shekahwat has been calling MPs and legislators for votes in his capacity as Vice-President and not as an independent candidate. “The question whether a person has become insolvent and whether he/she is still an undischarged insolvent has to be decided by the competent insolvency court under the provisions of the Provincial Insolvency Act, 1920, and not by the commission,” observed the poll panel in its ruling. Delhi-based advocate Manohar Lal Sharma approached the commission after the Supreme Court rejected his plea seeking cancellation of nomination papers of Pratibha. The petitioner, in his plea, asked whether an un-discharged insolvent and one facing criminal charges under Sections 406 and 409 of the IPC was eligible for election as President? Sharma said Pratibha was an undischarged insolvent because the Sant Muktai sugar factory of which she was the founder-member and then chairperson owed Rs 17.7 crore to Mumbai District Cooperative Bank. Bhim Singh, who today left the Capital for a week's tour to different parts of the country to seek support for Shekhawat, said Vice-President had won all-round praise for the manner in which he conducted the proceedings of Rajya Sabha during the past five years. In his letter, Panthers Party chief has appended remarks by senior leaders of the Congress, CPI(M), SP, AIADMK, TDP and PMK praising Shekhawat on completing four years as chairman of the Rajya Sabha. Expressing surprise at the "change" in the stance of these parties, Bhim Singh said Shekhawat had resigned from the BJP after he became the Vice-President and was contesting the poll as an independent candidate. He has termed Patil as "Congress-Communist-Shiv Sena candidate". Talking to reporters on the sidelines of a function to facilitate an army team that climbed the Everest, Defence Minister said Army was not satisfied with the field trials which ran for over four years. “We will issue fresh tenders at the earliest and ensure that these guns were inducted into the Army within the shortest possible time”, he said. Chief of Army Staff General J.J Singh, who was also present at the function, said the guns from Bofors and Soltam had not met qualitative requirements. The Army wants to purchase a total of 400 155-mm 52-calibre field or artillery guns. While the deal is estimated to be worth over Rs 4,000 crore, India would also be looking at manufacturing over a thousand guns under the transfer of technology which would be part of the deal. Army had conducted a total of four rounds of trials in summer and winter for the guns between 2002 and 2006. A Bench of Chief Justice K. G. Balakrishnan and Justice R. V. Raveendran issued notice to the prosecution seeking its reply to her petition. Bedi, who allegedly had married Salem and was convicted with him by a Lisbon court after Portugal authorities had arrested them, claimed that she would not get fair trial in Madhaya Pradesh. She had already been convicted by a court in Andhra Pradesh in another passport forgery case against which she had filed an appeal in the state high court. Monica allegedly possessed two passports. Terming the entire plan as “machination” by vested interests to grab land in the riverbed in the name of the Games village, they have asked her to get the Games village proposal reviewed by an independent committee. The environmentalists insist that till the committee completes its investigations, all ongoing construction and plans in the riverbed be put on hold. In the letter addressed to Mrs Gandhi, NGO Yamuna Jiye Abhiyaan (YJE) said there were enough alternative sites in the city that could have been considered and selected right at the beginning.